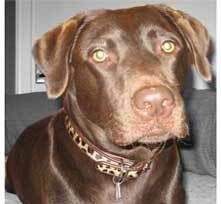 Our Cowhide collars are a great choice for labs and retrievers alike. 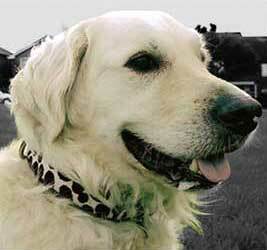 Hand made in fabulously waterproof ‘hair on’ cowskin and supple calf leather, they are strong, yet kind to neck fur. Hand in hand with their everyday hardiness goes their wonderful colourways - from classic Reds to the almost luminous Pink with Orange and many other great colours. 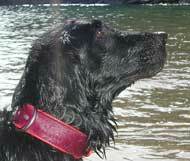 Our dogs swim and mud roll in them and yet the collars come up time and again looking good as new. 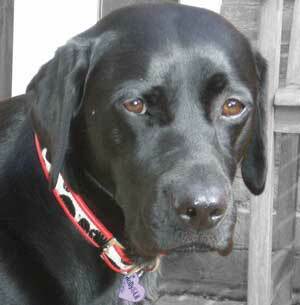 The dogs shown here are wearing our signature ‘Wide’ collars. These are slim under the chin and broaden out onto the back of the neck, giving a convenient D-ring lead connector at the back of the neck. 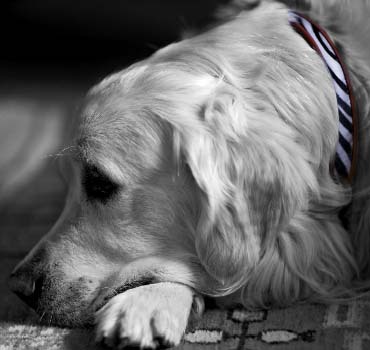 Our traditional ‘Slim’ collars also work very well on these bigger breeds….but given the choice, we would always opt for the Wides as being the most stylish and practical. The widths of all our collars are scaled according to size, but because they are made in our own workshops in England, we offer a bespoke service allowing you to have any colourway made in any size or width. 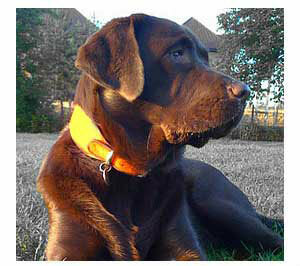 The Safari print cowskins are a very distinguished choice for labs and retrievers – a hardy collar with a sense of fun! Being made of Italian calf leather, our colours stray true and the leather supple. 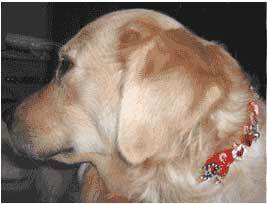 Labs and Retrievers both have natural oils in their coats which feed the leather as they wear it and keep it in great condition; though the occasional rub with leather food will be good for collars which are regularly in water. 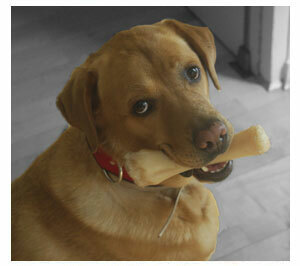 A couple of years ago, a customer came to our stand at Crufts.. 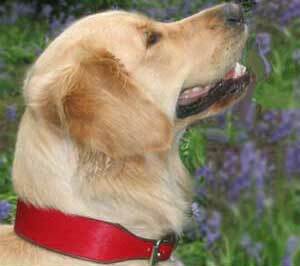 Some months before, she had bought a Holly&Lil red cowskin collar for her husband’s working collie and panicked as she left the Hall, thinking “What have I done buying (what looks like) a fashion collar for the dog?” Her husband laughed when he saw it, but once it had been on the dog for a while he asked her to come and find us at Crufts… to thank us for the great collar….and buy the matching lead! Harris Tweeds and Scottish tartans are another personal favourite of ours. The essentially ‘country’ feel of these wonderful hardwearing fabrics really suits the working heritage of Labs and Retrievers. 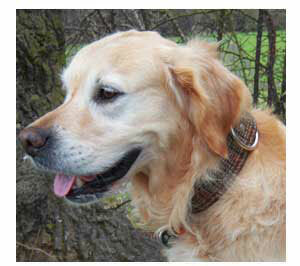 We can also make you collars and leads in your own clan or family tartans or Estate tweeds. Please ask us for further details. They also look adorable in the classic structured elegance of the Manhattan Stripes and the stylish humour of the Pirate range.. 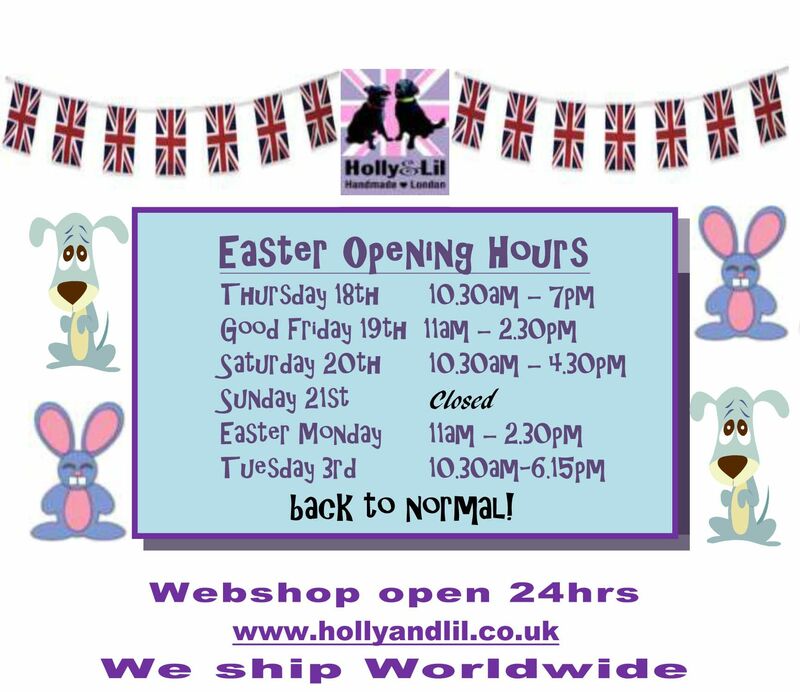 Some of the more boisterous need a little help with correction but here at H&L we still believe your dog should be glamorous. 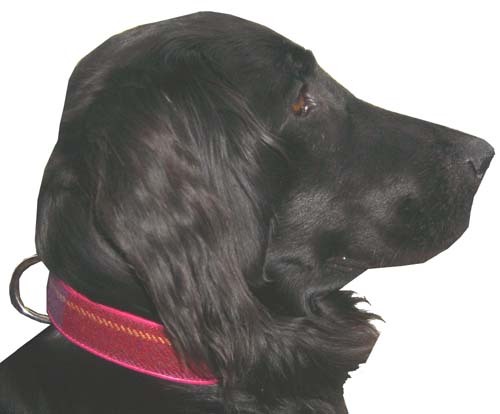 Many of our designs can be adapted to work as a half check collar (and we can also make other specialist restraint/training collars and leads to order. Moving away (only) slightly from the absolutely practical, our adorable Beau Belles collection looks heavenly on Lil and she still goes out on adventure- packed walks wearing it. 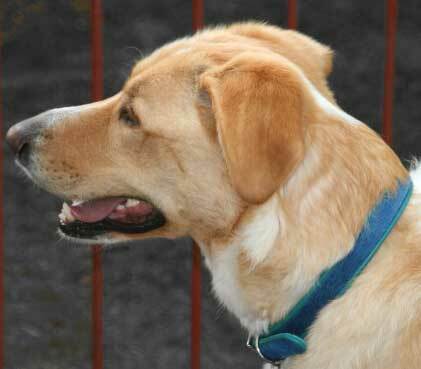 Our only caution is that it your dog does run madly through brambles or wrestle with other dogs, then bows should be kept for slightly more sedate outings. We have several great colourways, but you can create your own to special order. 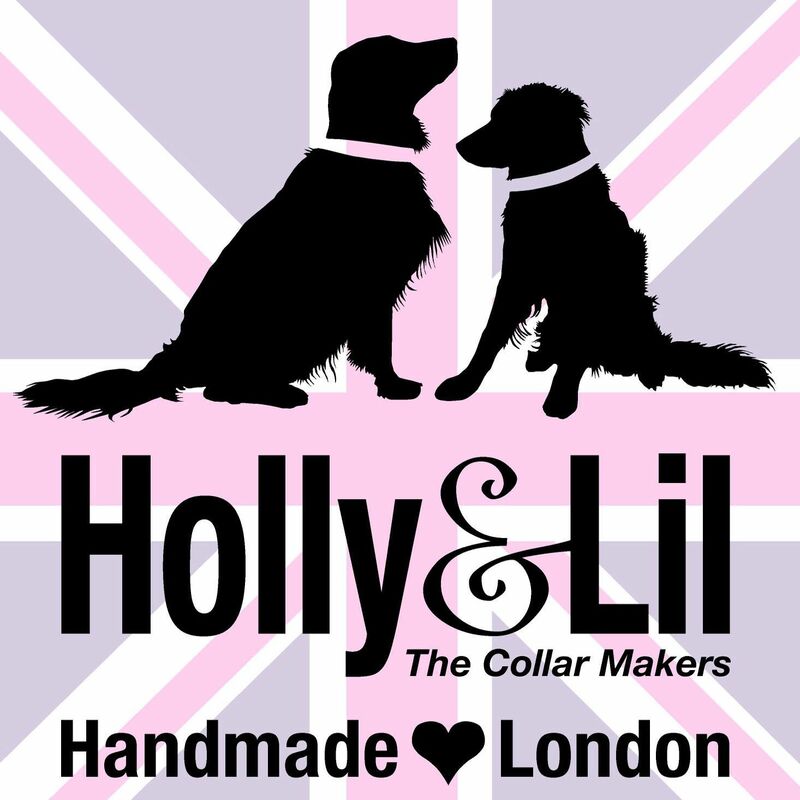 Our Harnesses are individually made to order by our craftsman (delivery 6-8 weeks) and can be as plain and simple – or as decorative – as your heart desires. 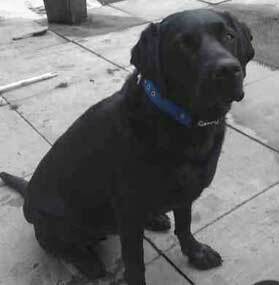 Most Labs and retrievers take our ‘Large’ size, although we will ask your dog’s measurements so we can make sure it is just right. The main body is calf leather with soft, padded, chest 'plate'. The calf leather straps are all adjustable, allowing you to get a perfect fit. 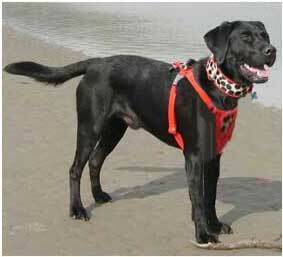 This is helped by the connecting rings which allow the harness to move comfortably with your dog. 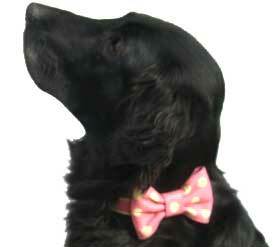 Our one-off Charm Collars are very much a special occasion collar for a Labrador or a Retriever. 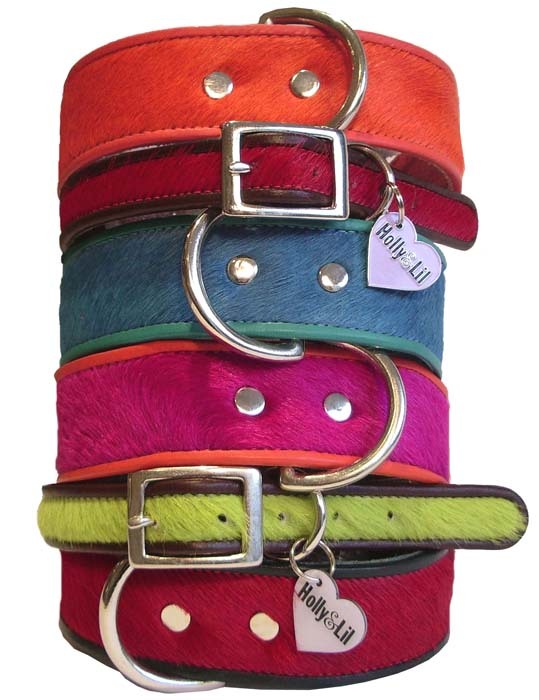 Made to order, the designs and leather colourways can be mixed and matched to suit your dog. 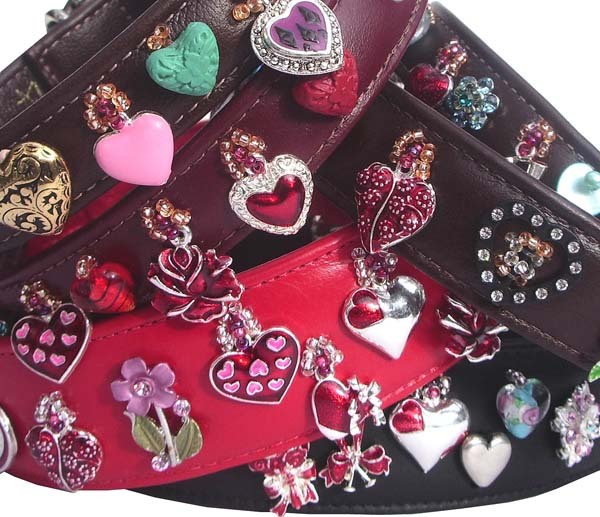 “Hearts & Flowers”, for example, can be sewn on any of our calf collar colours . Each one we make is an individual piece. 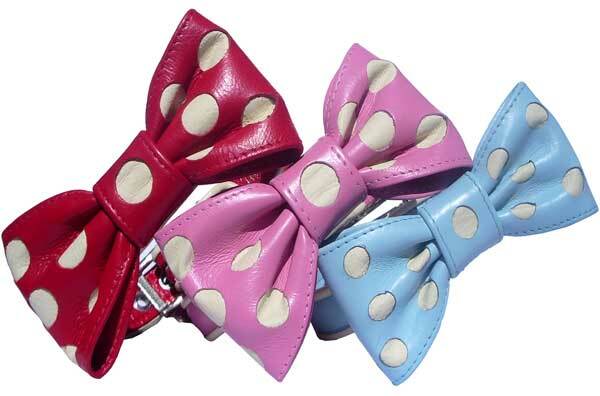 All of our calf collars can be supplied with a matching lead and some clients buy a Charm collar and lead for smart days with a matching plain collar for going wild in the country! 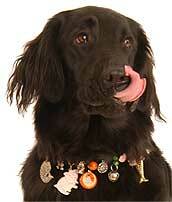 You may love them in our Semi-Precious or Beaded Ranges as well. There’s just so many to choose from! 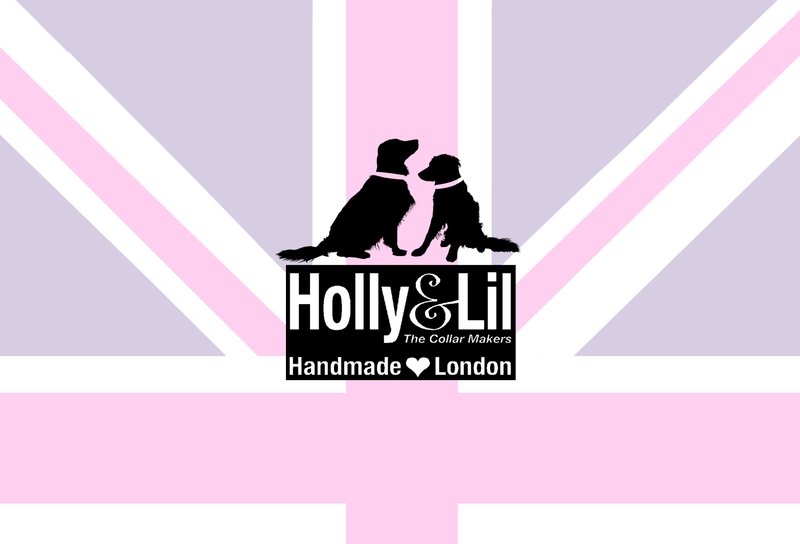 And remember if you have an idea for something you would like us to create specially for your dog, do go to Make Me One, let us know and we will do our best to make it for you. 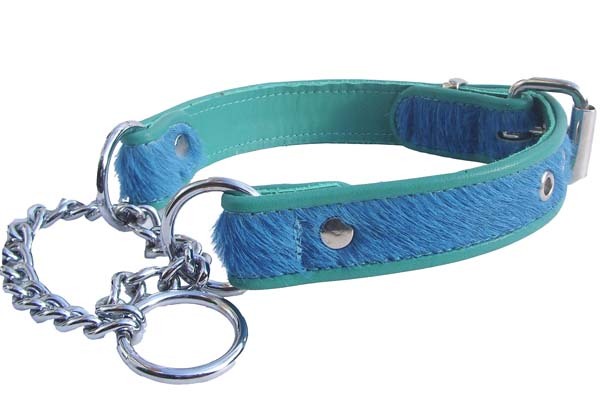 b) from the centre of the buckle to your dogs favourite hole.